Looking for a USED LINELOADER? The overhead shuttle system is a simple and cost effective solution. This system should be used when the glass is oriented on the rack such that the outside surface of the glass is in the 'up' orientation on the line. 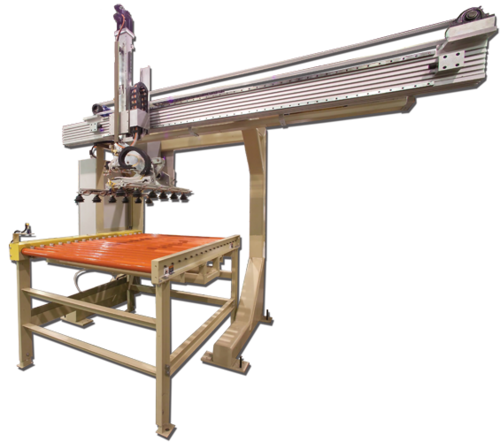 The system also is easily configurable to different configurations, either loading/unloading in-line or perpendicular to the production line. The unit also lends itself easily to the use of a Turntable for automated rack change. The shuttle consists of a main horizontal beam, which has been machined and mounted with a linear motion slide arrangement. A carriage unit is mounted to the slide arrangement, and is driven along the beam via timing belt and AC motor. Attached to the carriage is the vacuum frame sub-assembly. A pneumatic cylinder is used for tilting of the entire assembly from vertical to horizontal. A vacuum cup sub frame is bearing mounted to the tilting frame. An air cylinder is used to pick the glass from the rack, and, after tilting, setting the glass back onto the conveyor. The vacuum cups are mounted to aluminum extrusion via T-nuts and handles, which can be loosened, and the cups easily adjusted to a new position. Air hoses are attached to the cups via manifolds and shut-off valves, in order to place some cups out of service for various sizes and shapes of parts. A control panel can be included depending on the needs of the Customer. Vertical Axis - provides the ability to pick parts from different heights, for example, if parts are stacked on racks in tiers or levels. Servo shuttle axis - typically, an ac motor can be used, but in fast cycle rate applications, a servo motor will be fitted, allowing for faster start/stop and accurate positioning. Part location - depending on the application, various squaring systems can be applied. Looking to Purchase a New GLASSLINE LINELOADER?